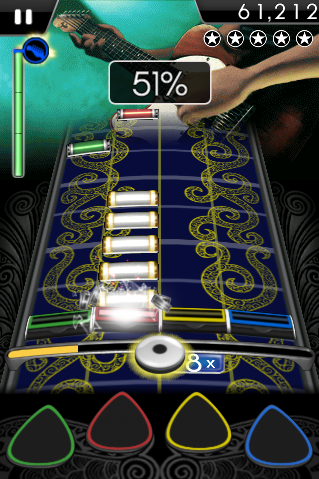 Watch your back, Tap Tap Revenge: Rock Band is coming for the iPhone, and it looks slick as hell. And as a bonus, this is one version of Rock Band that won't clutter your living room up with toy guitars. Don't be fooled by impostors, Rock Band for iPhone is legit. It may have taken a year to build, but the mobile version matches everything you've come to love about the original, right down to the awesome graphics and the ability to hear mistakes. Of course, you're playing on your iPhone, so you'll use your fingers to tap to the rhythms of four different instruments. The app comes with 15 songs – familiar tracks from past and present – with 5 additional songs that you can unlock as you complete the World Tour, as well as options to buy more. The game supports single-player game play, multi-player mode over Bluetooth, and Facebook Connect integration for inviting friends to play.